Russia’s ambassador to Turkey has died after being shot by a gunman at an art exhibition, Russian state media is reporting. After shooting Andrei Karlov, the gunman may have shouted, “We die in Aleppo, you die here,” according to reports. Karlov was shot while touring a photo gallery at the Museum of Modern Art in Ankara. The gunman, wearing a suit and tie, shot him in the back as he gave a speech. The Washington Post is reporting that a gunman was also been killed. It’s not yet clear if there was more than one attacker. 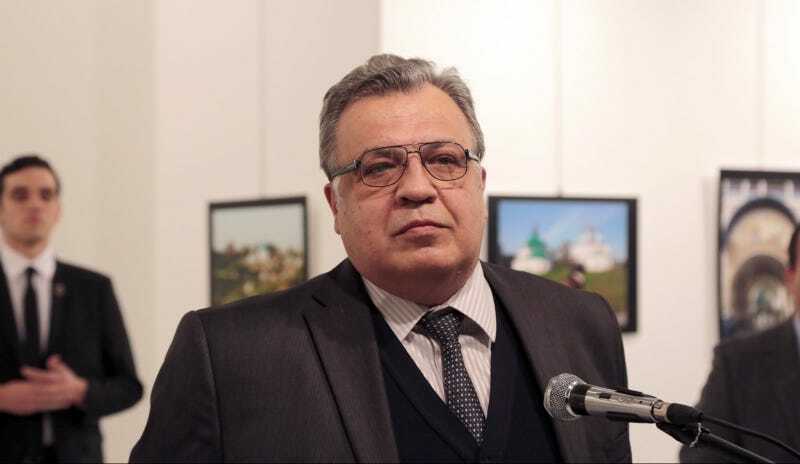 In photos of the event, the gunman can be seen looming behind Karlov as he speaks. Social media and press wire services are filled with images of the gunman brandishing his weapon next to Karlov’s prone body, as gallery attendees huddle in a corner, some of them weeping. Karlov was transported to a local hospital, where he was pronounced dead less than an hour later. Reuters is reporting, per their sources, that the gunman was a police officer in Ankara, but was off-duty at the time. The U.S. State Department is warning citizens of an “ongoing security incident” near the U.S. Embassy. We don’t yet know what it is or whether it’s related to the shooting but citizens are being warned to avoid the area. The AP is reporting that three other people were wounded in the attack, and that the gunman shouted “Allahu akbar” as he fired. He’s also said to have smashed several photos hanging in the exhibition, per the AP photographer who was there. President-elect Trump has yet to comment on the attack and I am frankly dreading the moment that he does.